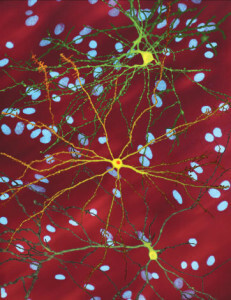 Neurons are vital for many processes not previously associated with them. 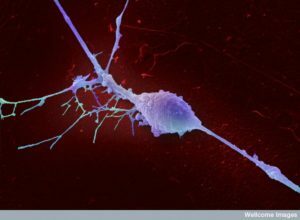 Neurons can stimulate all of the symptoms of inflammation and use these mechanisms for neuroplasticity. Complex interactions of inflammation and cancer are now coming into focus and neurons are an important part of this picture. Cancer has been called a “wound that doesn’t heal” since it is the inflammation milieu that enables cancers to be so disruptive in terms of developing mutations for their benefit, and stimulating all the local cells in the environment to help them. Another neuronal process is wound healing and in lower animals, limb regeneration. Neurons are now known to be involved in the complex interactions between the formation of cancers, inflammation, and wound healing, and limb regeneration. When neurons are cut, cancers don’t grow well and metastatic activity stops. Regeneration of tissue after damage, regeneration of limbs, inflammation, and the development of cancer share the same neuronal mechanisms. In all, neurons seem to like stimulation of the stem cell niche the best for some of these interactions. In abnormal circumstances, they promote healing, repair, and regeneration of tissues by affecting stem cells. And it appears that they do the same to promote cancer. New observations of regeneration in lower vertebrates and even in some mammals for digits are showing the vital part neurons play. These mechanisms now appear to be similar in the ways neurons help cancers grow. When salamanders grow back a limb, they need neurons to do it. If neurons are cut, they don’t grow. 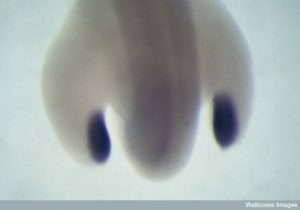 The same occurs in worms with head regeneration and starfish. Mammals grow back the tips of fingers and this needs neurons as well. Now, in gut and prostate, cancers need neurons to grow, and use some of these same mechanisms. This post will try to capture some of the very complex multi-faceted interactions that occur in regeneration, inflammation, and cancer and how neurons are vital to all of them. In some species (even some vertebrates) the process that occurs in the developing animal occurs a second time after damage for regeneration. Some species re build the exact missing part. Others make an attempt to build the exact structure, but the process is disorganized and forms a new intermediary bud like structure called a blastema. Then, the blastema is built in stages into the limb or a version of it. This later type of regeneration where a blastema is formed has similarities with cancer development. As with cancers, there are conversations between epithelial and mesenchymal cells (see previous post). The continuum between these two types of cells and alterations that occur between them defines aspects of cancer and metastasis (structural cells versus moving aggressive cells). Another similarity is the importance of stem cells. A third is the use of new blood cells and inflammation. Perhaps most importantly, neurons invade the blastema for further development. 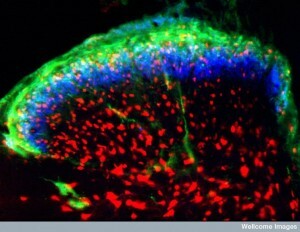 Neurons stimulate both the regeneration and the tumor. 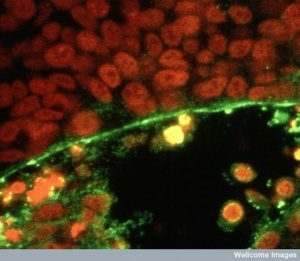 First, a layer of epithelial cells covers the wound or amputation. Then mesenchymal connective tissue develops that creates the blastema. 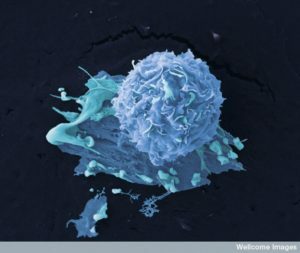 Stem cells form an edge of growth. The epithelium keeps growing and the whole process gradually replaces the missing limb. There are a range of stem cells in this situation making different kinds of cells like in the fetus. Some become connective fibroblasts making matrix, some muscles, some bones, and some epithelium. Neurons grow into the tissue during the entire process, to the epidermal tip and the mesenchymal region. If neurons are moved in a different direction, then limbs grow in the wrong new spots. In humans there are examples known of neurons working closely with cells to make organs such as the salivary gland, the inner ears, and lung airways. In general, the research shows that neurons are necessary for limb regeneration, but there is a lot we don’t understand. The concept of neuronal stimulation of organs and cancer is relatively new and as a result all the research has been done for limb regeneration in amphibians. There are a series of molecules that have recently been discovered that are involved. Some are neurotransmitters, other neuro peptide factors, and molecules that form gradients and form shapes called morphogens. Research shows there are unknown factors in the spinal cord involved. With amputation this effect increases. There are also chemicals in the blastema that call for neurons. Recent research shows signaling conversations between the neurons and blastema cells as well as neurons and cancer cells. In cancer, neuronal signals can make cancer more aggressive. For the blastema molecules somehow involved include transferrin, neuregulin, and substance P. In the blastema, norepinephrine and acetylcholine are not involved, but they are with heart regeneration and with prostate and stomach cancers. Nerve growth factor NGF and neuregulin also increase regeneration. Three factors affect growth and shape—nAG (newt anterior gradient), BMP2 (bone morphogenic protein 2) and FGF (fibroblast growth factors)– in both the first growth and the regeneration. nAG appear in neurons and gland cells in the blastema. nAG without neurons can also stimulate regeneration somewhat. Humans don’t have nAG, but some other proteins are similar (AGRs or anterior gradient proteins). In life, they exist only in the endoplasmic reticulum membrane and is not used as a signal. They also exist in cancers. FGFs and BMPs are used as signals from nerves to the blastema. They work to stimulate regeneration including producing axons in the blastema. They produce blood vessels as well. Along with the very important signal sonic hedgehod (SHH), these molecules show the position of the shapes and are highly related to neuron activity. All of these exist in some form in humans for future research into possible human regeneration. Immune cells and inflammation interact with this process. To complete the limb, the blastema needs macrophages that produce growth factors. 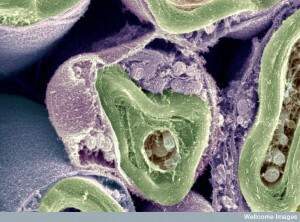 Macrophages are also in communication with neurons. Glia cells outside of the brain are called Schwann cells and they are involved in limb regeneration in amphibians, but also in digits in mammals, and cancers. There are many other factors just now being identified that are somehow involved. Until recently, the relation of cancer and neurons have been thought to be that cancers invade around neurons, surround them, and grow further into the nerves. This “perineural invasion” is associated with aggressive cancers and it was thought that it was because there was a ready roadway for the cancer to develop along the neuron. But, recently it appears that neurons are more involved in actually promoting the cancers, at least in prostate and stomach cancers and metastases. 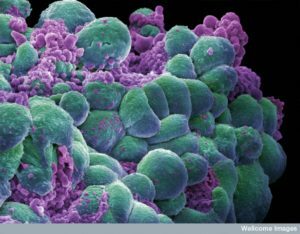 Neurons grow into the prostate cancer environment and make the cancer worse. Recent research shows that more than neurons (sympathetic and parasympathetic neurons) are essential for this growth. Sympathetic neurons provide increase in the early cancer and parasympathetic later. The more neurons in the cancer the worse the cancer was. There could be other neurons but only these two were looked at in the most recent research. In stomach cancer, the vagus was needed in every stage of the cancer’s growth. Very recent research finds that with neurons, pancreatic cancer moves along the axons. This growth along the axons is stimulated by factors from glia (GDNF or glia derived neurotrophic factor). The more neurons, the more dangerous the pancreas cancer. Basal cell cancers in the skin are reduced by cutting neurons. In colon and breast, the more neurons the worse the outcome. In breast cancers, sympathetic neurons can cause metastasis. Both the neurons and the cancers send signals, and factors. These factors affect both and the supportive stromal cells in the micro environment. Cancer signals grow the neurons and stroma. In prostate cancer, norepinephrine and acetylcholine receptors exist on the supportive cells and the cancers. These receptors stimulate tumor growth and aggressiveness. In stomach, cutting the vagus stops acetylcholine. Neurons stimulate the connective tissues and epithelial cells to grow a new environment as in regeneration in amphibians. Cancer cells have receptors to these sympathetic neurotransmitters. Cancer of the ovary increases metastasis with these neurotransmitters. Also, they increase blood vessels. Beta blocking drugs for hypertension appear to help cancer patients (prostate, breast, ovary). Stress increases these neurotransmitters from the adrenal. Dopamine seems to limit new blood vessels and can stop cancers. 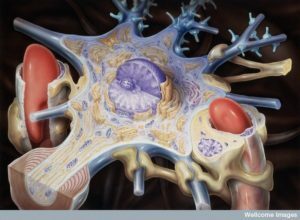 Neurons normally stimulate stem cells in the bone marrow making blood cells. This is also the case in the intestine where stem cell niches are stimulated by neurons of the cholinergic type, along with substance P, and CGRP calcitonin gen related peptide. Cutting the vagus in stomach cancer stops the tumor from growing. A particular important pathway (Wnt) is inhibited with less signals that go to the stem cells. This occurs through cholinergic signals. Wnt is a vital pathway during fetal development and is also important with cancers that utilize many of the original pathways that are used to build a unique organ. In worms, this pathway works with the hedgehog signal (HH) in neurons and it defines the shape and directionality. When mammals regenerate the tips of fingers Wnt must be involved. Again, there is a strong similarity between cancer and regeneration pathways with Wnt in neurons related to gastric cancer stem cells. In basal cell cancers conversations are noted between neurons and stem cells. These cancers occur near sensory neurons and hair follicles. 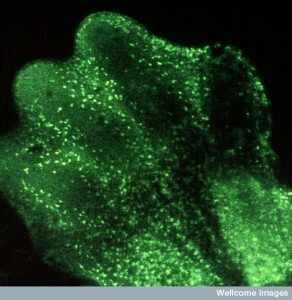 The same HH pathway in neurons for touch signals to stem cells. 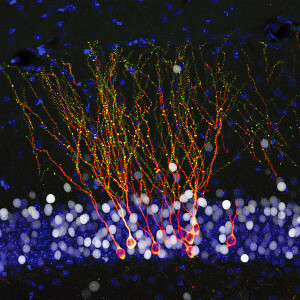 These signals from neurons allow the stem cells to create a variety of cells. This is similar to regeneration processes in blastema and mammal digits. In prostate cancer, study of gene networks shows that they are altered to signal to help more nerves grow into the cancer. While the exact neurotransmitters are not yet known, the neuron is clearly signaling to the stem cell to help the cancer. Previous posts have elaborated on how neurons can signal to produce all the aspects of inflammation. Also, it is well known that the chaos of inflammation allows cancers to dysregulate cells to create more mutations affecting repair of genetic damage and help the cancer grow. Recent research finds a connection between the neuron regulation of immune function and inflammation and its role in cancers. One example is where adrenergic signals from neurons drive more macrophages into breast cancers. These macrophages have a strong influence on increasing metastasis. Again, this is similar to a process in regeneration of the blastema. There are many twists in the findings, however. It is not a simple one-way stimulation of cancer. An example of this is a study where the vagus nerve is cut stopping cholinergic stimulation of cancer. What happened is the decrease in cholinergic signals increased blood cells that suppress T cells that would kill cancers. The overall effect was more cancer. As with many other areas of interactions, immune responses can go in multiple directions by stimulating particular pathways. Cells make myelin to cover neurons allowing fast signaling in both the central nervous system (called oligodendrocytes) and outside of the brain (Schwann Cells). 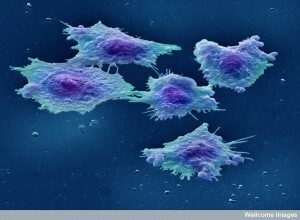 These Schwann cells are involved in discussions with cancer cells. A previous post showed how important supportive cells are to producing metastatic sites. Schwann cells actually invade a region in the pancreas and colon to prepare the niche before the cancer invades. These supportive glial cell can change its nature near the cancer and travel closer into the cancer. The cancers are part of this process by sending signals to the Schwann cells. Help from these Schwann cells was found to be necessary for the neurons to surround and invade the area near the neuron but also for the cancer to encroach on the territory. Again, this is similar to its role in regeneration in blastema and digits. Most of the research thus far has been for increasing an existing cancer. But, the similarities of wound healing, inflammation, tissue modeling, and the start of cancers have raised the question of the influence of neurons in starting cancers. Clearly neurons are vital for repair of damage to tissue. Wound healing is impaired in diabetes without neurons and in those with spinal injuries. 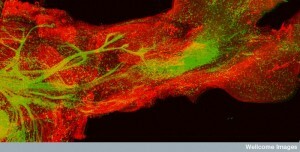 A signal from neurons (NGF) stimulates healing and rebuilding tissues. The most is known from stomach cancer and basal cell cancer. In both lacking neurons slows the start but doesn’t completely eliminate it. In pancreas the Schwann cells seemed to promote the start. Some of this research is confusing. Some show that cutting neurons in skin and with partial gastrectomy appeared to increase the start of a cancer. Previous posts noted that cancer interactions are different with epithelial and mesenchymal types of cells and the transition from one to the other has different effects in supporting the cancer. Another factor is that cancer signals increase neurons entering the region and increasing axons. Cancers produce a variety of factors and receptors that help axons and neurons (NGF and other factors). These signals seem to help in all three major stages of cancer—survival, growth, and aggression invasion behavior. These factors from cancer cells also help the cancer cells. A signal is found in prostate, breast, and stomach cancers that increases neurons and axons. BDNF is a well-known stimulator of new brain cells and also increases cancer cell’s aggressive behavior. NGF is produced by cancer cells after cholinergic signals from the neurons, and then this produces signals for more neurons. NGF calls for Schwann cells and this calls for cancer cells and increases cancer invasion near the neurons (perineural invasion). Another important set of signals are molecules that guide the movement of neurons in brain development. Tumors use these same guidance signals to reroute neurons to the cancer and in turn neuronal signaling to allow the cancer to be more aggressive (Semaphorins producing interleukins). Some signals help the cancer survive treatments. These signals can come from a variety of different local cells. 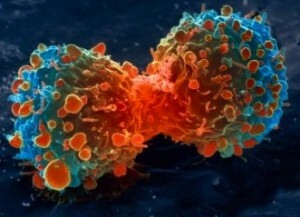 These guidance molecules may also help the cancer cells move. All of this research shows back and forth conversations in both regeneration, healing, and cancer development among many kinds of cells including cancer cells, neurons, and glia. 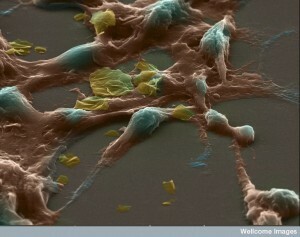 Neurons and glia stimulate cancers and cancers stimulate more neurons that increase metastasis. Many factors and signals are involved. New treatments for cancer will come out of understanding these conversations. This entry was posted in Blog, Cellular Intelligence and tagged Limb regeneration requires neurons, Cancers require neurons, Inflammation can be caused by neurons. Bookmark the permalink.